Join us in Watsonville for a UC Santa Cruz Original Thinkers event. It's been a time of unusual conditions in Monterey Bay. The bay turned a spectacular turquoise blue in July, humpback whales came so close to shore in September that crowds gathered to watch. High levels of toxin derailed the winter crab season. 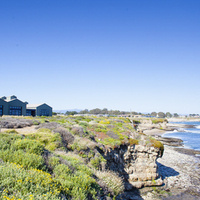 Ocean scientists and marine biologists at UC Santa Cruz are seizing the opportunity to study the dynamics of coastal ecosystems and how they are likely to respond to a changing climate. Hear about their findings first-hand in this "Original Thinkers" speaker series presentation. "Droughts, Warm Blobs, Toxic Algae - Will El Nino Save Us? " "Sea Change? Forecasting the effects of ocean acidification in the coastal zone"